We have been learning about pumpkins in our homeschool as part of our nature curriculum, Exploring Nature With Children. 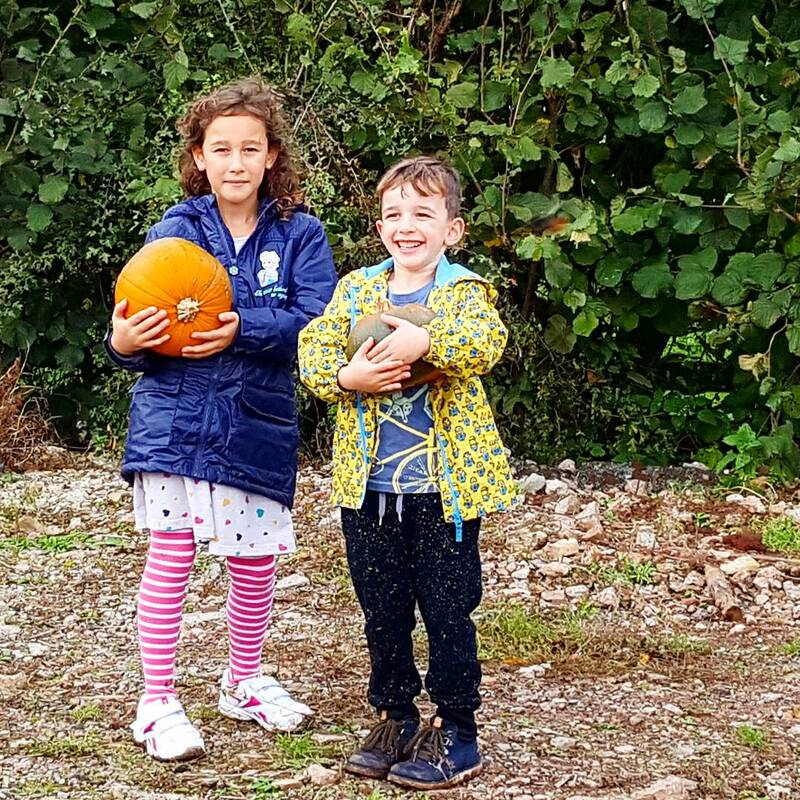 I decided to take the children pumpkin picking for the first time. We have been fruit picking many times in the summer, but we had never been pumpkin picking before. 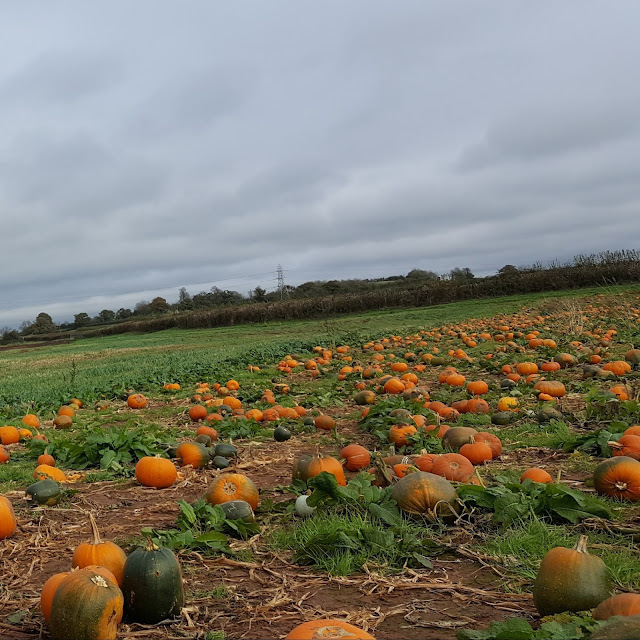 We went to a farm in Farrington Gurney which had some activities going on for the children as well as a field full of pumpkins where people could pick their own. The children had fun looking around the field at all the different pumpkins before choosing one each. 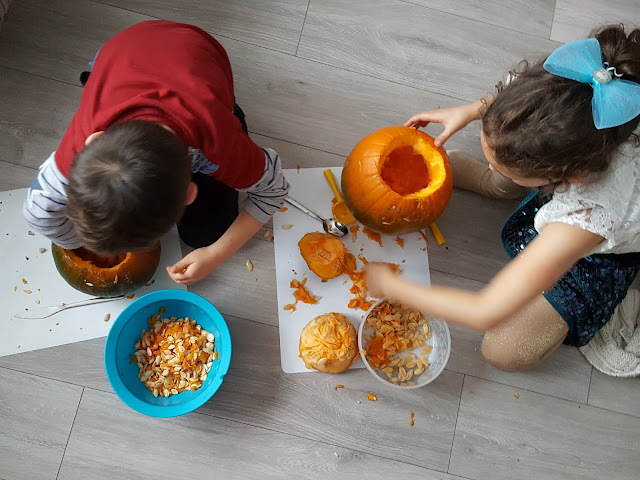 When we got home, the children were eager to carve the pumpkins. 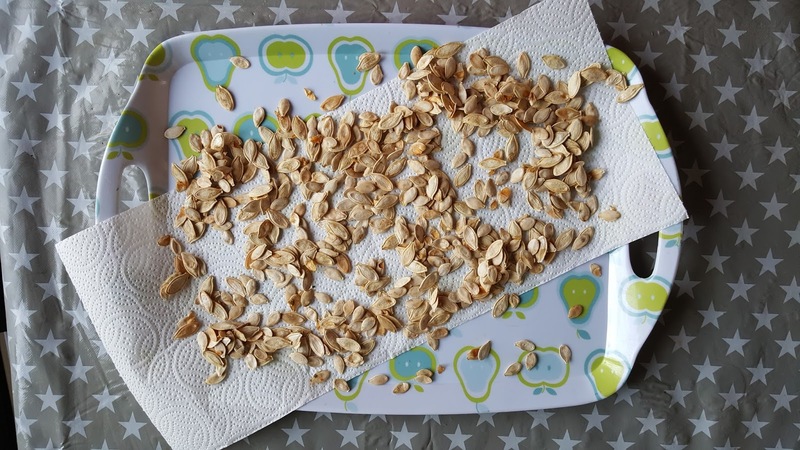 They sliced the lids off and then got to work scooping out all the seeds. 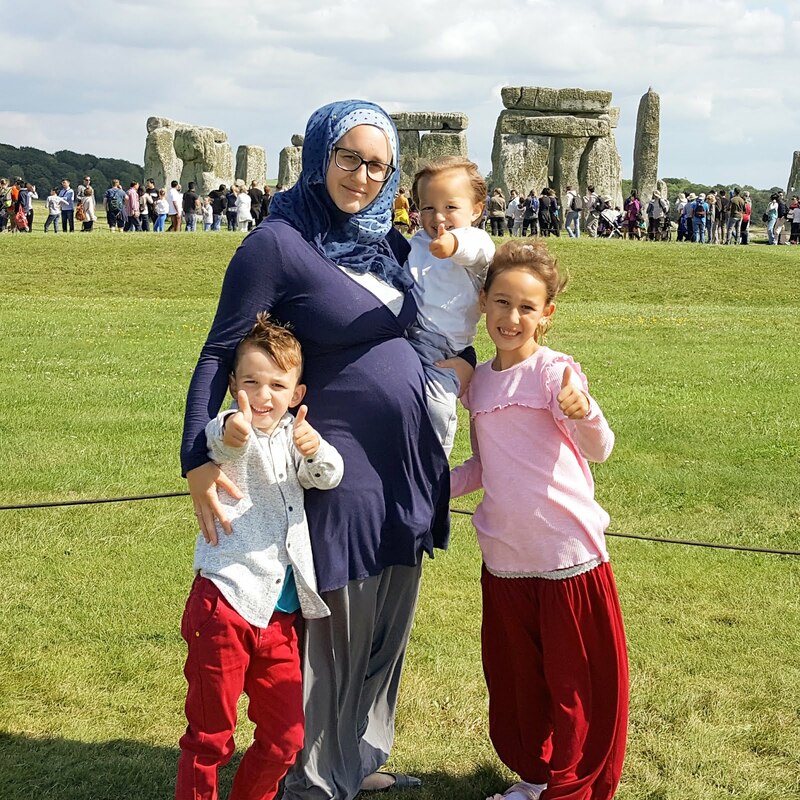 We soon discovered it was easier to use our hands than a spoon. 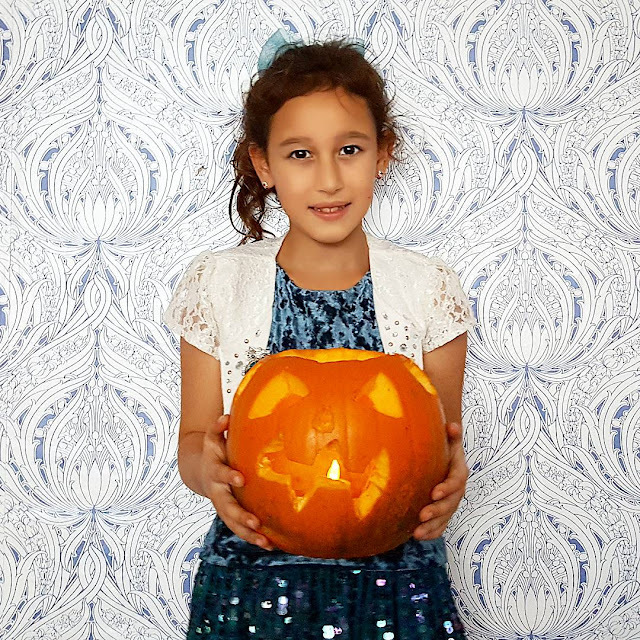 Once we had got all the seeds out, the children carved faces into the pumpkins. Then they placed electric candles inside which are which are safer than real candles. We washed the seeds and placed them on a tray for a few days to dry. 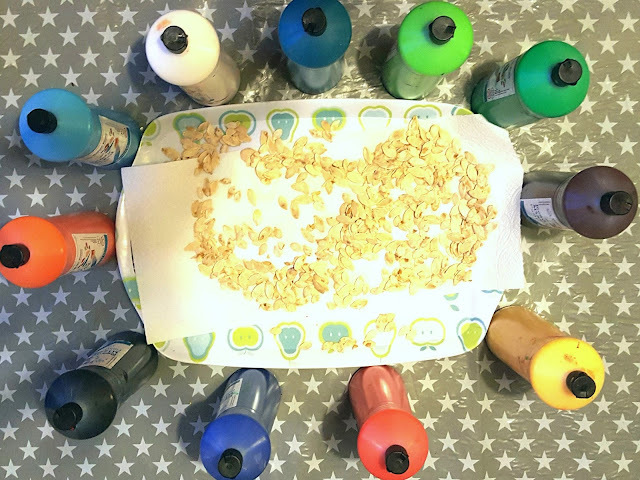 Once they were dry we painted them with poster paints. 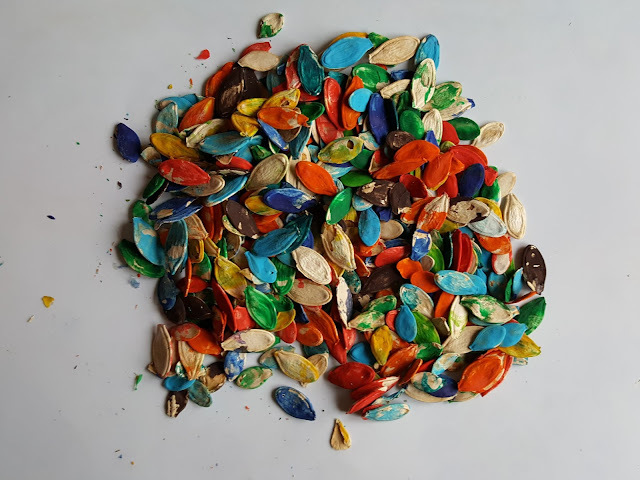 When the seeds were dry, the children could use them in a few different ways. 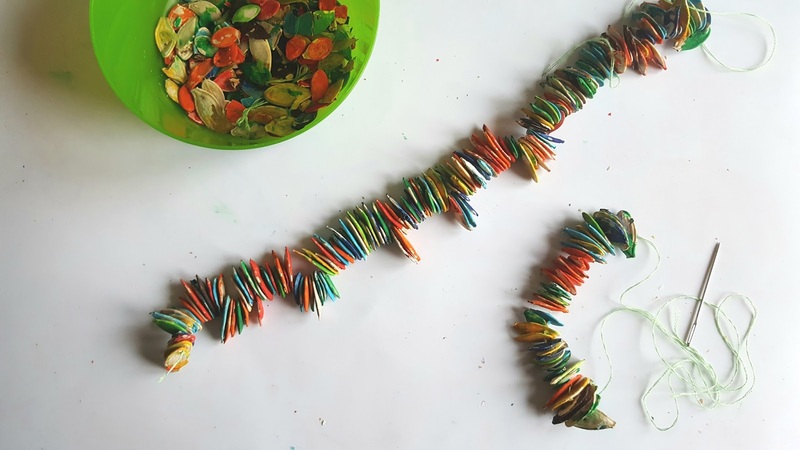 The older children threaded them onto string to create necklaces. 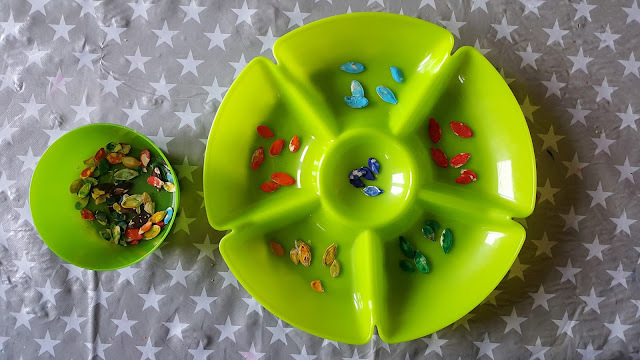 While the older ones created their necklaces, I set up this colour sorting activity for K. I gave him this sectioned serving dish and let him sort the seeds into different compartments by colour. This is always a favourite activity for toddlers. 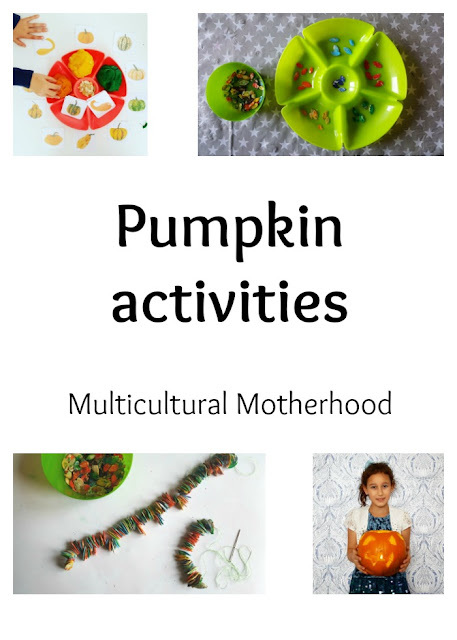 Next, I found these pumpkin printables online and printed off two copies. I cut up one set to use as flashcards. K was able to use these in a matching game. 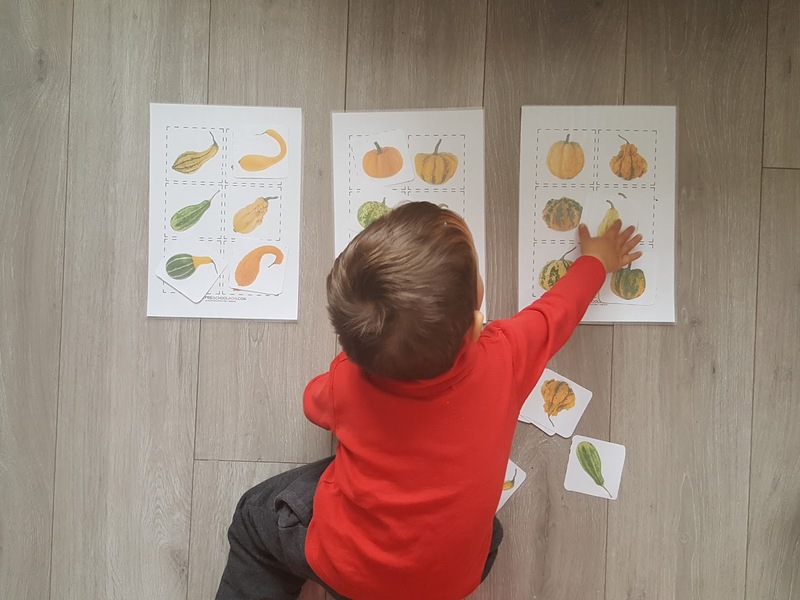 He matched the flashcards to the pumpkins on the sheets. He really enjoyed this activity. 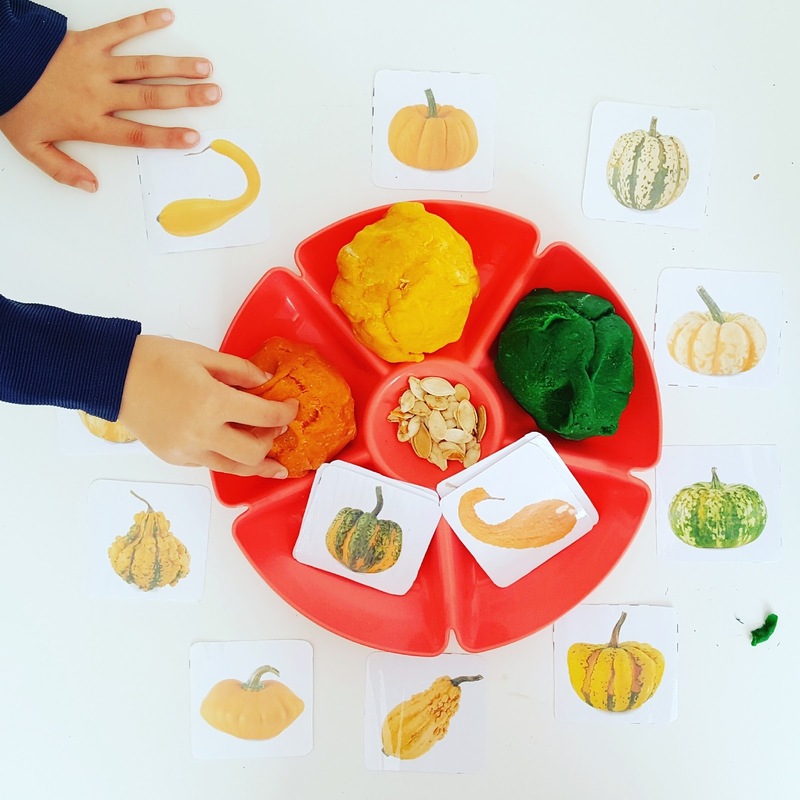 Finally, I set up this pumpkin invitation to play using some of our homemade play dough and pumpkin seeds. I gave the children the flashcards and asked them to create the different pumpkins out of play dough. 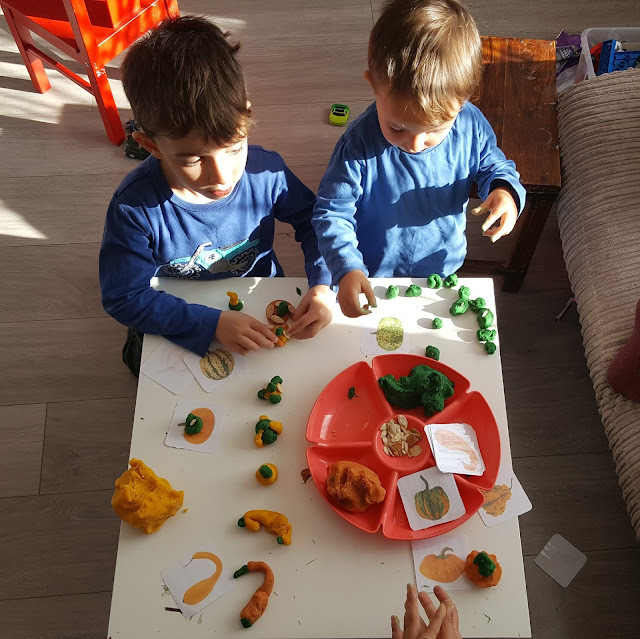 They were amazed at all the different types of pumpkins and had a lot of fun creating them out of play dough. 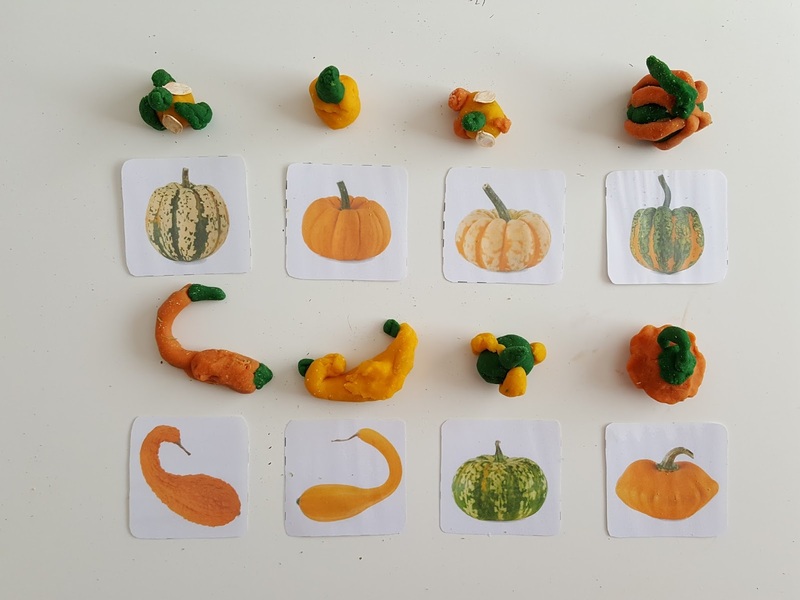 We have really enjoyed our pumpkin topic and look forward to studying them again next autumn.